This list touches upon some of the outstanding entrepreneurial contributions of U of T Engineering graduates. We hope to see this list grow over time, and would like your help. Please send any major entrepreneurial achievements of our graduates to The Engineering Newsletter. This list will be posted on the Alumni & Friends website in the future. The following list is sorted by graduation date of our U of T Engineering entrepreneurs. Civil Engineering graduate Edward Lancelot Cousins consulted on the development of world class ports, including New York City’s Port Authority. He also planned the Toronto harbour and waterfront. Civil Engineering graduate Harry Tate played a key role in developing the TTC and Canada’s first subway line. Edward S. Rogers Sr., who studied Electrical Engineering at the Faculty from 1919-1921, was the first to invent the batteryless radio receiver, power rectifier pentad tube and spray-shield tube. He started the world’s first all-electric radio station, CFRB, and was the first Canadian amateur radio operator to transmit a signal across the Atlantic. 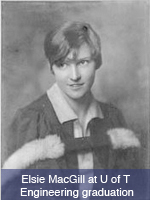 Electrical Engineering graduate Elizabeth "Elsie" Gregory MacGill was the first female aircraft designer in the world. Electrical Engineering graduate Frank Henry Ralph Pounsett designed the first car radio for General Motors of Canada. Mechanical Engineering graduate Paul Dilworth co-developed Canada’s first jet engine, the Chinook, in the late 1940s. Electrical Engineering graduate James Ham was the tenth President of U of T, as well as founder of the Canadian Institute for Advanced Research, the basis of Canada’s Federal and Provincial Centres of Excellence. Graduate of then-Metallurgy, now Materials Science and Engineering, Gerald Heffernan pioneered the mini-mill steel manufacturing process. Mechanical Engineering graduate Frank Milligan is the founder and Chairman of Thermal & Hydraulic Equipment Ltd, a distributor of industrial machinery. He recently funded 20 graduate fellowships in MIE and IBBME for students in biomedical engineering. Chemical Engineering graduate Lewis Urry developed the first commercially alkaline battery as well as the lithium battery, while working for the Eveready Battery company. His alkaline D cell prototype is honoured in the Smithsonian museum beside Edison’s light bulb, and was voted one of the 100 greatest inventions of the millennium by Popular Science magazine. Mechanical Engineering graduate Ernest Dainty is acclaimed worldwide for his leadership of a team of U.S. and Canadian scientists who developed a practical ceramic particular filter for diesel engine emissions. He directed the transfer of this technology to produce a mine-filtering system credited with protecting underground workers from the hazards of diesel fumes. Civil Engineering graduate John Bahen changed the face of the nation through construction of projects such as mass-transit systems in Montréal, Toronto and Vancouver, the James Bay hydro facility and the Hibernia oil-drilling platform. Mechanical Engineering graduate Bill Shaw won an Oscar for his role in the creation of the IMAX (short for image maximum) projection system. Chemical Engineering graduate Howard Goodfellow has received numerous awards in his career, including the Canada Medal from the Society of Chemical Industry. President of Tenova Goodfellow, he developed a technology that reduces natural gas consumption by 33% in electric arc furnaces. Phillip "Rocky" Simmons, a graduate of Chemical Engineering, founded Eco-Tec Limited, an international leader in the development of water treatment and chemical recovery systems used by power generation, pharmaceuticals, automotive, chemical, pulp and paper, and metal processing industries worldwide. Alumnus and Professor Emeritus Joseph C. Paradi currently leads five small businesses - Parcorp Ltd., Translucent Technologies Inc., Softek Computer Services Ltd., DesignCo Ltd., and VeraPar Kft. his first business, Dataline Inc., employed 185 people and brought in sales of $25M in 1987. He left Dataline and joined U of T in 1989 and created the Centre for Management of Technology and Entrepreneurship. IBBME and Chemical Engineering University Professor Michael Sefton is a world-renowned leader and pioneer in the in the emergence of bioengineering and also in the development of tissue engineering as a science, a technology and as an industry. University Professor Sefton is a graduate of Chemical Engineering. Chemical Engineering graduate Columba Yeung, Chairman and CEO of the Value Creation Group, developed technology that is described as the most energy-efficient, environmentally friendly, and cost-effective method developed to extract and refine bitumen from Alberta's oil sands. Industrial Engineering graduate Tom Closson's name is synonymous with accountability and excellence in Canada's healthcare system. Over the past decade he has served as President and CEO of three major healthcare corporations, most recently at University Health Network (UHN) in Toronto where he doubled the research funding to $156M and was an important player in the establishment of MaRS. He is a highly sought-after advisor of healthcare issues in Canada. Civil Engineering graduate Paul Cadario is an example of how U of T Engineering prepares graduates to be global leaders. With a record of accomplishment spanning North America, Europe, Africa, and Asia, Cadario holds a senior leadership position at The World Bank. Three-time U of T Engineering alumnus and Professor Ken Martin created multi-million dollar Snowbush IP with alumnus and Professor David Johns, which is one of the world's leading analog intellectual property suppliers. Professor Martin has also started a new company called Granite Semicom. Professor David Johns, a BASc graduate of Engineering Science as well as MASc and PhD graduate of Electrical and Computer Engineering, created multi-million dollar Snowbush IP with alumnus and Professor Ken Martin, which is one of the world's leading analog intellectual property suppliers. Professor and Chair of The Edward S. Rogers Sr. Department of Electrical and Computer Engineering, Jonathan Rose is an Engineering Science graduate who co-founded a successful software company called Right Track CAD Corporation, which was purchased by Altera. Chemical Engineering graduate John Voss established Aegent Energy Advisors Inc., a company that helps large energy buyers reduce cost and mange risk. In the first seven years of the company's establishment, they supported more than 50 clients representing $700M in annual energy procurement. Materials Science and Engineering graduate Gino Palumbo runs one of North America's most successful nanostructured materials research companies. They have contracts with the U.S. Air Force and NASA, and hold the first U.S. patent issues in nanotechnology. Palumbo is a three-time graduate of U of T Engineering. Electrical Engineering graduate Jeffrey Skoll co-founded eBay – the world’s largest online auction house - enabling worldwide buying and selling of goods. Mechanical Engineering graduate Keith Thomas is President of Vive Nano and a proven entrepreneur. A U of T spin-off company, Vive Nano is a developer and supplier of leading-edge nanomaterials solutions to manufacturers and was founded in 2006. Founder of CARGO, a cosmetics company with environmentally friendly products coveted by stars in Hollywood, Civil Engineering graduate Hana Zalzal hopes to inspire women to play, celebrate, and reinvent. A graduate of our MEng, Pierre Rivard is co-founder of Hydrogenics Corporation, a leader in global development of clean energy solutions and one of North America's fastest growing technology companies. While he was President and CEO from 1995-2006, he led the $120M acquisition of Stuart Energy Systems. Electrical and Computer Engineering graduate Anthony Lacavera co-founded Globalive Communications Corp. in 1998 and has since launched 18 products in 30 countries. In 2004 Globalive earned the top spot in Profit Magazine's list of Canada's fastest growing companies and has also been named one of Canada's Best 50 Managed Companies for three years in a row. in 2006, Anthony was named to Canada's Top 40 Under 40 list. Electrical and Computer Engineering Professor and Electrical Engineering graduate Ted Sargent received a $10M grant in 2008 in support of his research to further develop nanotechnology that uses the infrared rays of the sun to provide power for virtually anything that now uses electricity. In 2003 he was named one of the world's top young innovators by MIT's Technology Review and in 2005 he was named a research leader in the Scientific American 50. A graduate of Electrical and Computer Engineering, Mike Branch is the founder and President of Inovex Inc., a Microsoft Gold Certified Partner and Independent Software Vendor focusing on web and mobile applications. Electrical and Computer Engineering PhD graduate James Fung was featured in the Feb. 12, 2007 issue of Canadian Business magazine for his innovative invention, Glogger. A wireless technology that enables photos to be taken on camera phones and posted immediately to the Glogger website, Fung developed this technology with ECE Professor Steve Mann. Copyright © 2009 University of Toronto | Faculty of Applied Science and Engineering. All Rights Reserved.